The Huffington Post reports that a person using the service need only to walk up to an automated kiosk, check in, and go on her way. No paperwork, no showing of identification. 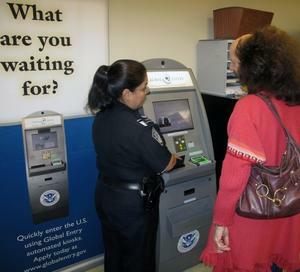 A traveler who becomes a member of the Global Entry service is automatically eligible for the Transportation Security Administration’s PreCheck service, designed to whisk people who are considered low-security risk security through checkpoints without removing laptops, shoes, jackets, or liquids and gels. The program is open to American citizens, permanent residents, Mexican nationals, and citizens of the Netherlands and South Korea. Canadian citizens can sign up for the Canada’s NEXUS border program and enjoy the same benefits. People who have a criminal record, or have had issues with U.S. immigration, will not be eligible for the programs. People can sign up by going to the service Web site, filling out an application, pay the $100 non-refundable application fee (there are several ways to be reimbursed) and go through an in-person interview at one of the enrolment centers located at airports around the country. In the interview, an official will ask the applicant personal questions and then a decision will be made on whether the applicant is approved of rejected for the program. If an applicant is approved, the membership will last for five years.